This book is part of the Monumental Legacy series, aimed at giving a brief and accurate introduction to the world Heritage (Culture) Sites in India. The Series in addressed to the general reader but is also of use to scholars interested in the history of the site. establishes Goa's cultural individuality, the basis for the distinctive character of the Goan church. describes the basic style of the Neo-Roman church specified by the five orders of classical architecture and lists the Goan church plans in vogue. gives a detailed account of nine churches as examples of Goan architecture, which either closely follow European models in idiom and style, or subject European forms to an Indian aesthetic. Richly Illustrated with maps and line drawings, the book will be of immense value to students of architectural history and the informed tourist interested in Goa and its culture. O fall the lands of Asia, India, which had previously hosted the inter-continental Islamic style of architecture, opened itself to the world's first global style of architecture-one that encompassed all the world's continents-in Goa. This style had sought to restore that of imperial Rome, and can be identified as Nee-Roman. 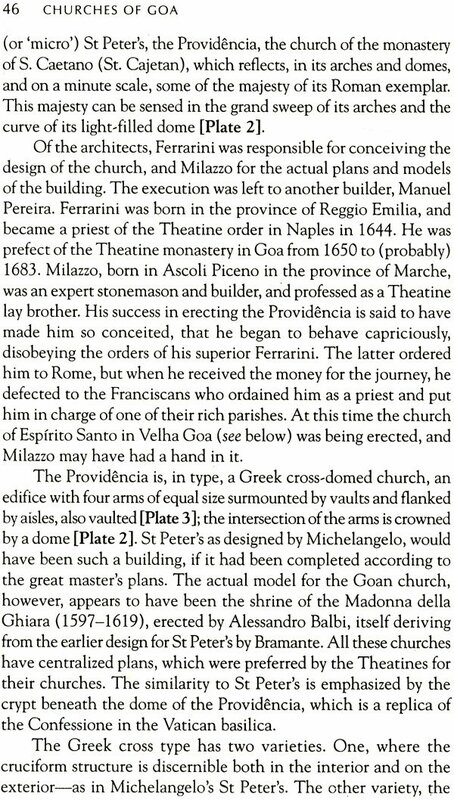 Goa's churches, Roman in scale, are the finest Neo- Roman monuments anywhere in Asia-not excluding the Philippines, the other Asian site of extensive Nee-Roman construction. (However, that storm-struck cluster of islands in the Pacific lacked the Indian millennial tradition of monumental building that had challenged the architects of Goa to build grandly.) We have chosen nine churches as examples of Goan architecture; they either closely follow Eutopean models in idiom and style, or subject European forms to an Indian aesthetic.' These nine monuments are prominent examples of the churches and 'convents' (monasteries and nunnery) which, in 1986, brought recognition to Goa as a world heritage site. It is with great sadness that I record the demise of my friend George Coelho (1918-99), who was to have been the co-author of this book. My special thanks are due to [oaquim da Costa and Rosario Coelho, to whom this book is dedicated. I am grateful to Paulo Varela Gomes for having brought to my notice an article by Rafael Moreira that identified the architects of Nos sa Senhora da Divina Providencia as Carlo Ferrarini and Francesco Maria Milazzo (and not Francesco Manco, as previously believed). The black and white photographs are by Dharampal Nanda, chief photographer of the American Institute of Indian Studies, Gurgaon, Haryana, and the colour photographs by Adelino Fernandes of Lorenz Photo Group, Margao, Goa.